The first thing to remember is that solar is not cheap! The power is free and sustainable, but it’s costly to get there. A person can spend as much money as they want in that direction. I did not go whole hog on my system, as I wanted primarily the ability to power a few small appliances, and mainly a power source to recharge my rechargeable batteries. I have a couple of systems setup in different locations, as well as the ability to setup portable arrays if needed. 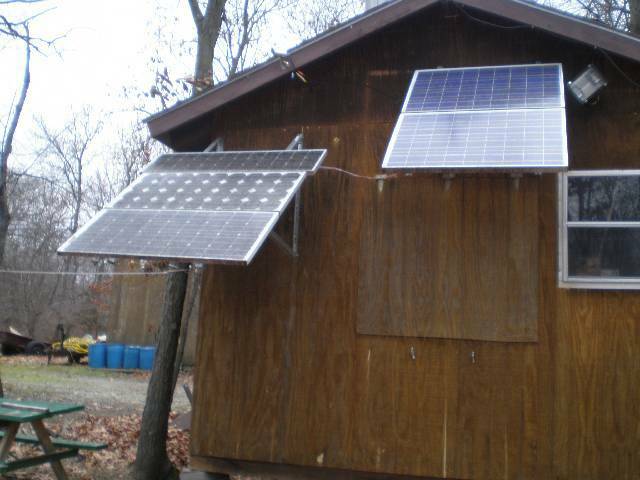 My main array consists of 4 – 85 watt and 1 – 30 watt panel. It is located on the southern side of a utility building that I have. 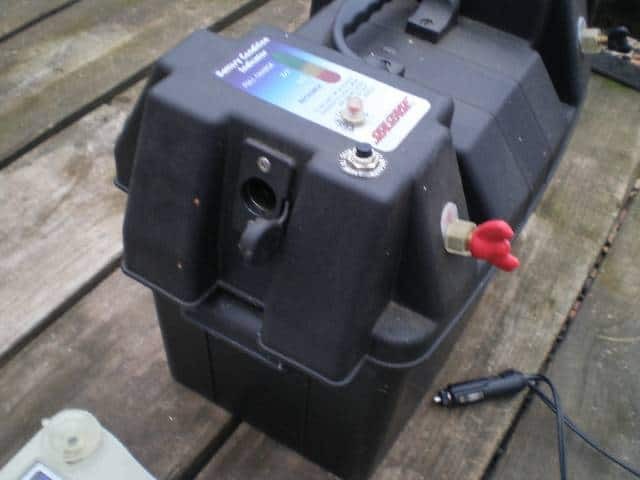 then it runs to a bank of 8 – 12v deep cycle marine batteries. 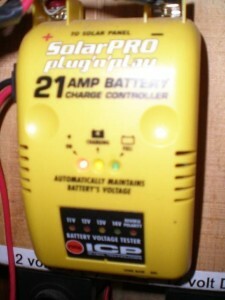 There are also 2 – 12v cigarette lighter type sockets to have the ability to run 12v appliances, if needed or desired. 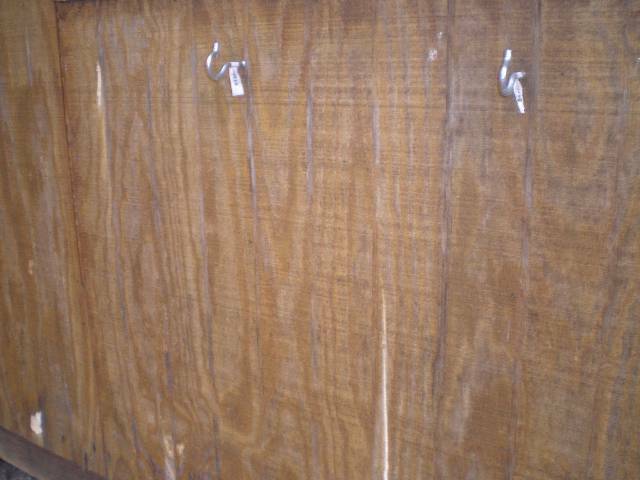 There are fry pans, ovens, coffee makers, etc. available to use. I do have a problem with this system though, in that I really hate to cut trees, as you can’t really replace them in your lifetime. So my system doesn’t get full sun all of the day. It gets about 2/3s of what it could get, but meets my anticipated needs. It will power a small freezer, or a portable ice maker, a 110v chain saw, and many other like items. It will also recharge any type of battery for any application. I also have a secondary array at a nearby building that is not used to its full potential, but is primarily a backup system. 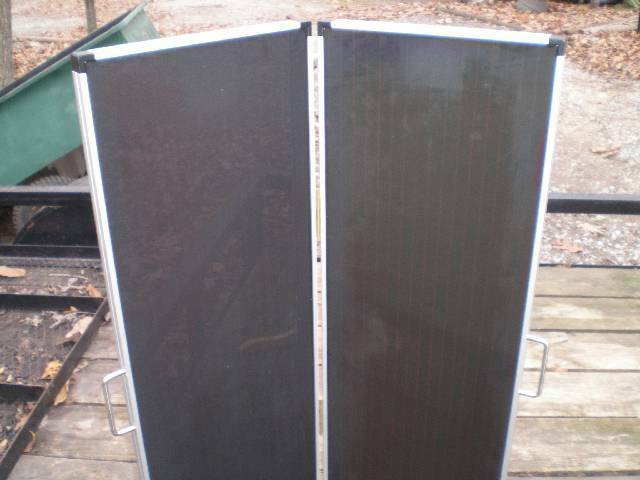 It consists of 1- 85 watt panel, and 2 – 50 watt folding panels. 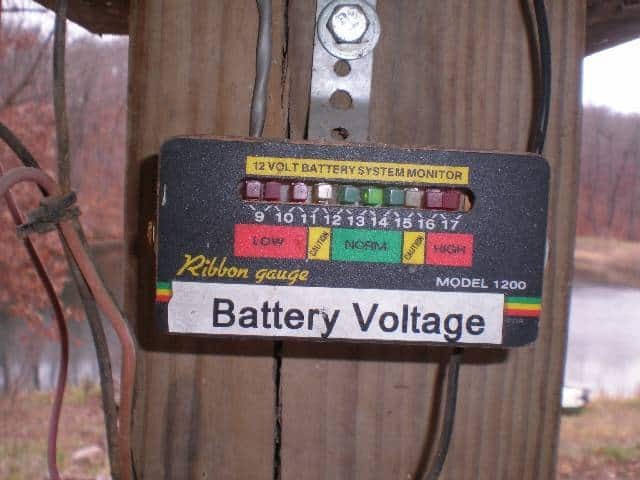 They run to another smaller charge regulator/controller and only 2 – 12v deep cycle batteries. 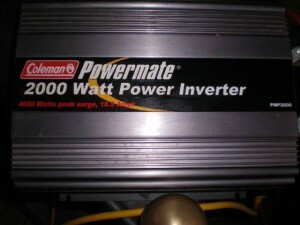 This then runs to another 2,000 watt inverter that is actually a backup in case of a failure of my primary unit. 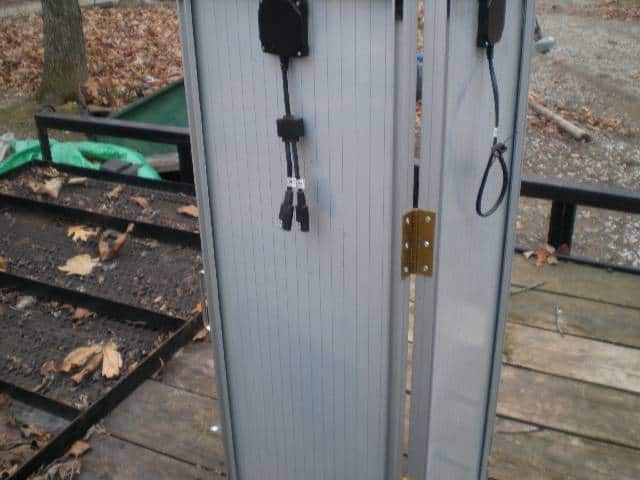 The panels on this array can be plugged into the main array by the use of polarized two way plugs, making it very modular for increasing power to the main system. 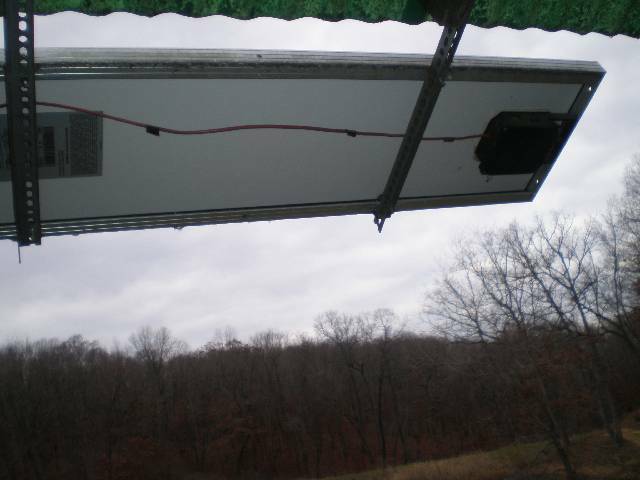 At my pond I have a shelter house on which I mounted a 30 watt solar panel. Then it runs to a smaller charge regulator/controller. 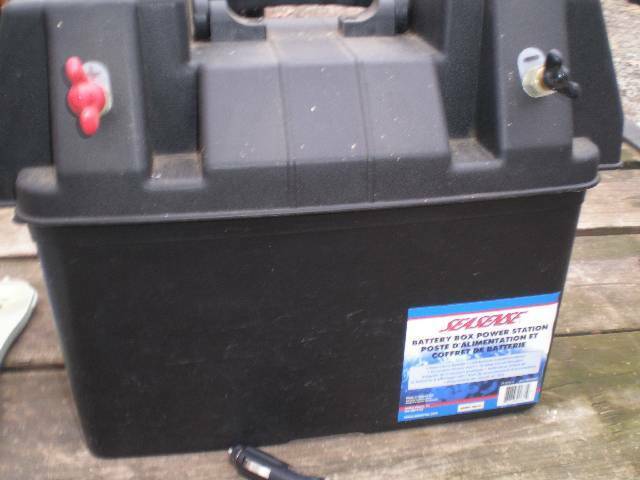 Then it runs to only 1 – 12v deep cycle battery. This runs out to 12v RV type lights in the ceiling of the shelter house, as well as a couple of cigarette lighter 12v socket outlets. I can plug in a 400 watt inverter to the 12v system and produce 110v power for most small appliances that I might use there. Last, but not least, I have several smaller panel setups that are extremely portable and powerful that can provide 12v power just about anywhere that has sun exposure. As I mentioned in the beginning, this stuff isn’t cheap. It was done over a long period of time, so it became more affordable. 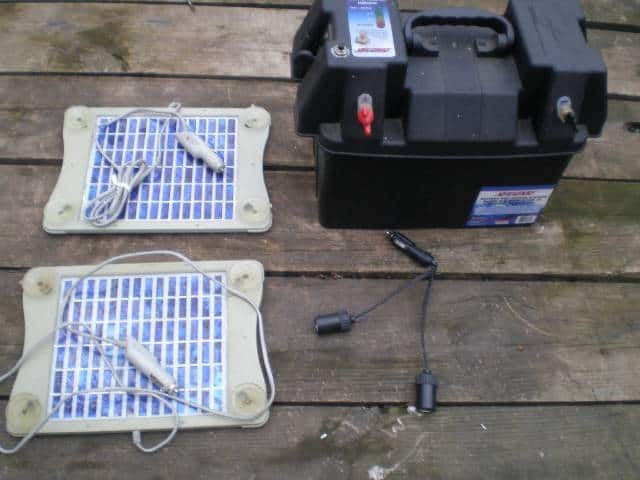 I started very small with a couple of the Volkswagen solar cells, a plastic battery box that had a built in12v lighter socket and external terminals, and of course a deep cycle battery, added to that a splitter that allowed multiple lighter sockets for plugging in 2 panels or for multiple power out plugs. In the future I will post some Do’s and Don’ts as well as some tips for use. 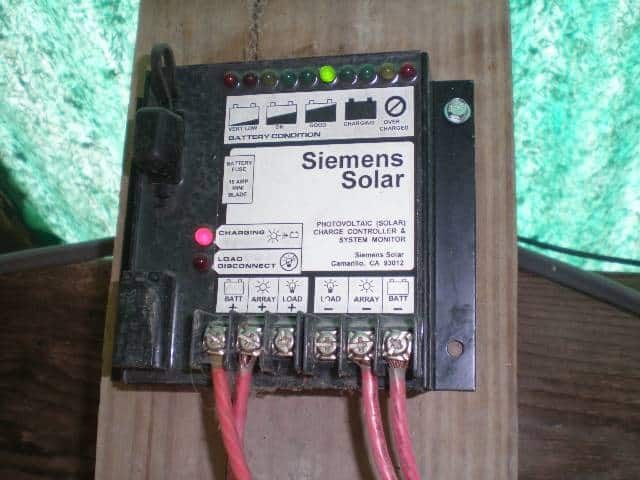 There is much to know about solar, but it isn’t as complicated as most might think, at least for the smaller setups like mine. The article above was an entry into the ModernSurvivalOnline Preparedness Guest Post Writing Contest. Have something to share? You could win one of the following prizes. Good article JFI, You really helped simply how you put your system together by your excellent photos. What would you estimate the cost of your system as you now have it? What a GREAT ARTICLE on SOLAR POWER! I liked your low end portable and folding set up. Novel and useful for security lighty or small power tools. It appears that your permanent system is getting a lot of shade (from the roof overhang?) This is beating the crap out of your power output. Just one cell covered by shade radically reduces output. You have also failed to address any safety issues (power cut-offs, battery out-gassing, wire sizing, etc) and component matching for efficency, that can seriously degrade performance.. When every component adds a percentage of loss it can really add up and destroy your watts per $ investment. Regards, D.
Rourke, This comment need not be published. For a good tutorial on solar electric energy please check out freesunpower.com . It is the most complete solar site i have found. Thanks for the great info, This will be my next summer project. Nice article, however I am left wondering about the point of the topic. Welp time for some product research and math at that I have no clue as to how affordable any of the described arrays are.